Apples are delicious to eat on their own. Add them into a baking recipe with a little cinnamon and it’s just heaven in your mouth. 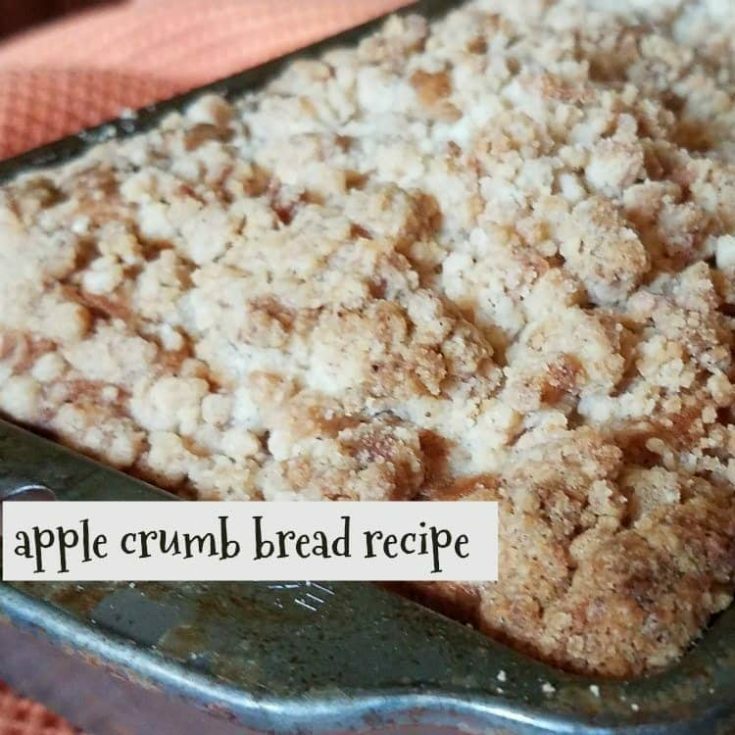 So soft and delicious, you’ll really want to make this apple crumb bread recipe ASAP. With so many apples to choose from, you need to ensure you select a baking apple for this recipe. Baking apples are soft apples that will bake and soften further, like granny smith and fuji. Harder apples like red delicious, take longer to bake. So you would have to adjust your baking time, and run the risk of burning your recipe, trying to soften the apples. So soft apples are best. Apples and cinnamon with bread are super delicious. What makes it super delicious is the cinnamon crumb topping that goes on top of the recipe before you bake it. The crumb topping gets very crunch and good. You will be asked for this recipe and want to make it often once you taste the delicious crust it forms on top of the fabulous bread. In a large bowl, mix the first 3 ingredients and then mix in the butter, milk apples. Combine the dry ingredients and add them into the wet ingredients and mix. Pour the batter into greased bread pan. Mix the crumb topping ingredients (powdered sugar, flour, butter and cinnamon together in a separate bowl until incorporated. It will look like marble like. Sprinkle on top of the bread. Bake for 45-50 minutes or until the toothpick comes out clean. Regina Sober is the owner and writer of Just Me Regina. She is a married mom of 2 on the go kids. She is passionate about sharing all things Michigan, home cooked recipes, traveling and sharing projects for their 140 year old farm house.